Direct fire is a military term for battlefield weapons fired with a direct line of sight on their target. Depending on the weapon and its projectile speed -- not a concern with evolving laser weapons -- it may be necessary to "lead" a moving target such as an airplane, so that the projectile arrives in the same place the target will be at its current range of motion. Some types of weapons, usually used for indirect fire, can be used in direct fire "over iron sights", typically in final defense of the howitzer position. The basic trajectory of an direct fire weapon is a parabola, but, for short distances, it may be approximated as a straight line. Of course, weather may affect the flight; wind usually needs to be considered. Firing through rain can be very unpredictable. 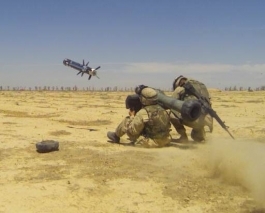 There are portable weapons, such as the FGM-148 Javelin, which still make the direct fire assumption that the operator has a direct view of the target to set the target into the weapon. 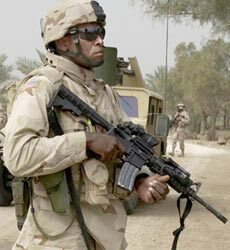 This allows them to fire over obstacles, and also to engage targets at greater range than can direct fire weapons. 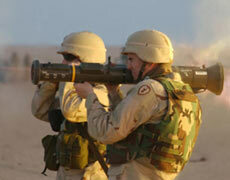 The Javelin missile, for example, is "fire and forget". Once the operator sees the target and locks his sight onto it, he can set the missile to fly a flat trajectory, as would be appropriate for shooting at a ground fortification, or a "pop up" to dive at a tank and hit it on top, where its armor is thinnest. This page was last modified 23:55, 26 June 2008.